A well marked Low pressure area lies over Telangana and adjoining South Chattisgarh and Vidarbha. This feature is likely to bring heavy to very heavy rainfall over parts of Telangana, Konkan and Goa. Heavy rainfall likely over Coastal Andhra, North and Coastal Karnataka and Maharashtra. Most parts of interior and coastal TN will experience above normal temperatures. Light thundershowers possible over parts of coastal TN. 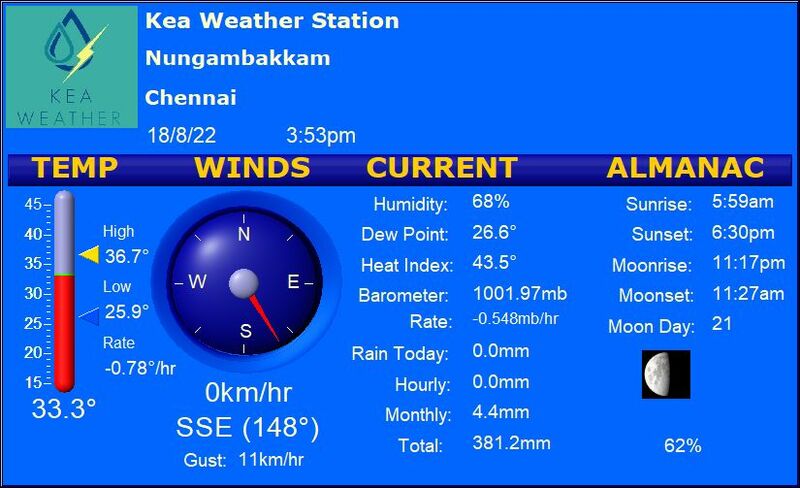 Chennai – Warm weather to persist with a high of 36 degrees and a low of 28 degrees. Light thundershowers possible later in the day. Coimbatore – Mostly cloudy sky with a chance of light rain/drizzles. High of 34 and a low of 23. Madurai – Hot weather to persist with a high of 38 and a low of 24. Tiruchi – Partly cloudy sky with a maximum of 37 degrees and a minimum of 27 degrees. Vellore – Maximum of 35 degrees and a minimum of 25 degrees with a chance of light thundershowers later in the day.